Auto locksmith concerns are a common occurrence in Wigan and Burnley not to mention Preston and Leigh. Blackburn appears to be well-off, but you’ll never know when a key can go wrong and stir up trouble. If you are anywhere in the areas above, having an issue with your key and frustratingly stuck, reach out to us by phone and our team of locksmiths will appear immediately. We make sure we go the extra mile to give you optimum services and are miles ahead of our competitors and even your dealer. Yes, you read that right. Your dealer would only have your best interests in mind, we agree. But in the scenario where you are stuck in your journey because of a misplaced or lost key, and is struggling hard to pull yourself together, calling your dealer might not be the most viable option. Let us tell you why. You had a long day, and the key decided to upset things, and now you are freaking out, rightfully so, but you need to cut yourself some slack because a deal with your dealer will surely involve transportation costs of your vehicle all the way to his/her workplace. Are you willing to spend a sizeable amount of money for this when you can easily call us, and our workers will come to you instead? It’s a no-brainer, we’d say. 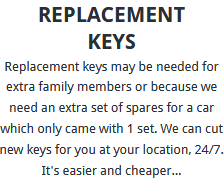 And who knows, a replacement key might even take more than just one or two days; instead, our workers can cut you a new key or fix your old one on-site and immediately. We all know how precious our keys are to us and we also know they can get lost easily. 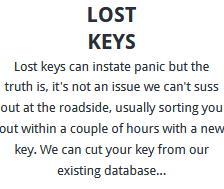 In case the key is lost, we will come to your place and offer you a new one without any delay. You have misplaced your key and are locked out, your search for it futile, but we’ll save you from this as we can fix you a spare key anytime of the day and anywhere, and for cars of all makes or models. There will be a routine verification, and after making the spare, the old lock system will be removed to protect it from any external intrusions. 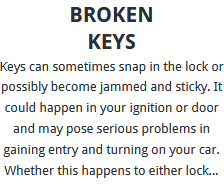 We also take care of all broken keys, and if you got it broken in your ignition, we’ll thoroughly wipe every last remnant off and give you a new, sturdier key. Only the experts can deal with transponder chips and ensure they don’t create further complications. Our team has the sufficient expertise and technological know-how to carry all transponder services smoothly and infinitely better than all our competitors. Our services are beefed up by the best Auto Locksmith equipment in town, and we only levy a fair fee. Spread across five cities in Bolton, Blackburn, Wigan, Preston, Burnley, and Leigh, our auto locksmith company can guarantee you services that cannot be provided by anyone else in the present market, including your dealer. Our services are open to every single car in town, and that means we can deal with cars of all prominent companies. Of course, we do understand that you’d usually choose your dealer over everyone else for security and reliability reasons. But what you get when you choose us is a far better deal, both regarding security and reliability and, also, money. Perhaps you are tired of towing your vehicle back to your dealer every time something goes wrong with the key. Or worse, the dealer can promise you a replacement only in a week. These are real issues that plague everyone alike, and we’d only be glad to put an end to this for good. Whatever your car’s make is, and wherever and whenever you are stuck at, all you have to do is call us, and we’ll quickly arrive to take care of your problem (We are already saving you quite a lot of money by coming directly to you). We are well-equipped to take care of any locksmith issues, and we have the best tools to do that. Is it a spare key that you need because you misplaced your key somewhere and it has now disappeared? Perhaps your kid started playing with it and eventually broke it, or perhaps you broke it yourself when you turned it around with a little more force than usual in the ignition? 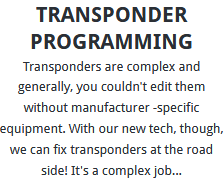 Or, to imagine another scenario, your brand new transponder key just stopped working altogether out of the blue. And since transponder keys are quite unpredictable, one can sit down and think of a hundred ways they can go wrong. In all five areas of Bolton, we offer Replacement Keys onsite with no delays. Even if you only need a spare, because you always are in mortal fear of losing your precious keys, we have also got you covered. And even if there is no original at hand, we can offer you a new spare key. For all Broken Keys, we’ll replace them with a stronger and more durable one. Your transponder keys will be dealt with expert care as our technicians are both well-trained and knowledgeable in the constantly shifting field of auto locksmith technology. As already mentioned, we deal with all kinds of car makes. Listed are some of them: Fiat, BMW, Chevrolet, Jaguar, Rover, Renault, Suzuki, Volvo, Mazda, Nissan, Citroen, Kia, Lexus, and much, much more! So what are you waiting for, we can solve all your problems, and that too at an affordable cost! Call us immediately. All Rights Reserved © 2018 Auto Locksmith Bolton.